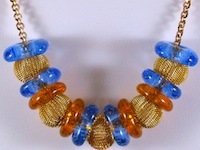 Make simple to elegant contemporary jewelry with Colour de Verre's Simple Round Beads mold. 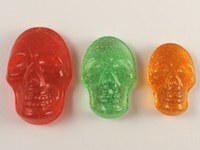 This video shows how the prepare, fill, and fire this mold and includes images of finished pieces. 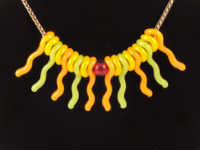 Make an enormous variety of round beads with our Simple Round Beads and Small Ring Beads molds and create jewelry that ranges from simple and understated to elegant. 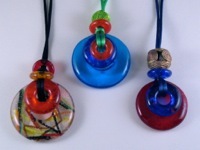 Colour de Verre's Pillow Pendants leave plenty of room for creativity and customization. Resutls can be simple and understated or elegant. 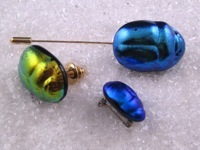 Colour de Verre’s Nano Beads are the smallest members of the Company’s Jewelry product line. 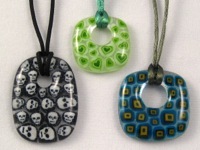 They look great paired with other elements of the Jewelry line or mixed with manufactured beads. 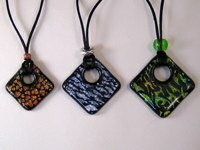 Our Tribal Beads are a stylized version of an ancient design. 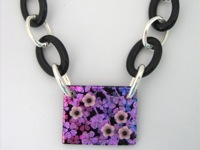 Our Geometric Beads are a very contemporary design. Both are easy-to-make and make great gifts. 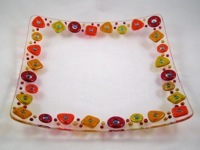 Our bead designs not only make exquisite jewelry, they can be used to create contemporary embellishments for plates, platters, bowls, and larger work. 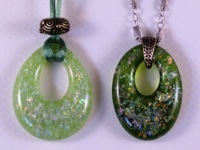 Create beautiful dichroic pendants and stunning beads by combining CBS Coating by Sandberg patterned sheets with Colour de Verre’s Pillow Pendant molds. 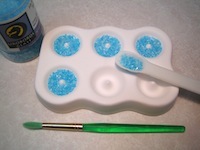 These are the basics techniques used with our Glasslinks molds to creating glass elements. 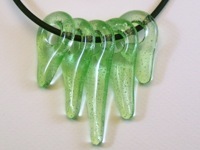 These elements can then be combined to create dramatic jewelry. 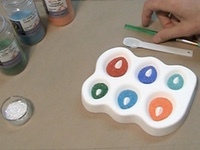 Even if you don’t want to make jewelry, the techniques in this project sheet can be used to make beautiful scarabs and ankhs for other purposes, for example, embellishing platters and plates. 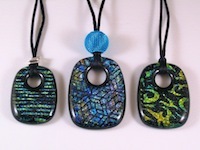 These pendants can be suspended from leather, rubber, silk, or metal cords to create jewelry ranging from simple and casual to dramatic and elegant. They are very easy to make and, because of the molds' engineering, there is almost never any coldwork envolved when MR-97 is used. 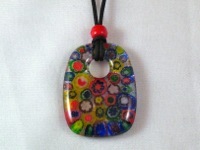 Create beautiful, old-world or hip, modern designs by combining millefiori, murrini, and Colour de Verre pendant molds. 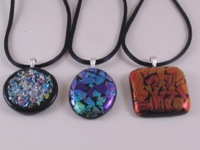 Whether you use dichroic trimmings and shards, or manufactured dichroic frit, the results of this technique are gorgeous.